We believe that planning a Christmas party should be fun and exciting. Evoking the true spirit of Christmas our expert team of event coordinators have been plannning meticulously behind-the-scenes to finesse all the small details for a magical festive season at Church House Westminster. Set within Dean's Yard and with gorgeous views of Westminster Abbey, our Grade II listed building offers a unique and memorable Christmas party venue. Whether you prefer a traditional setting with warm English oak panelling and domed ceilings, or a modern interior, we have a wide variety of event spaces to suit all tastes. The historic venue accommodates between 50 and 350 guests for a private Christmas lunch or dinner party and up to 550 for a corporate reception with drinks, canapes and bowl food. Our in-house caterer, CH&CO, has created a series of delicious and seasonal menus for Christmas parties. From seated menus to bowl food and buffets, there is an extensive list of options. We are also happy to create bespoke menus based on any special requirements your event may have. Our professional in-house team of audio-visual technicians will work closely with you to produce the perfect staging, creative lighting and pitch-perfect sound for your end-of-year celebration using the very latest AV and event technology. We have developed solutions to transform any space to fit your requirements and your event's theme. Watch a YouTube video of our recent venue showcase event, The Greatest Showcase. Minimum numbers apply. Cash or account bar available on request. For those looking to organise a themed Christmas party, bespoke packages are also available including reception packages with bowl food and canape menus, buffets and food stations (Best of British Pop Up Stalls). I just wanted to say a big thank you to you and all of your team for making sure everything ran so smoothly last night. I have received nothing but praise from everyone at Allocate regarding the venue, the music, the food and the staff. I think everyone thoroughly enjoyed themselves. Thank you for a marvellous evening on Friday, it all worked like a dream. The room, lighting and flowers looked fabulous and the food was delicious. You have an amazing team and I am always impressed how friendly and helpful everyone is. You're a joy to work with. Celebrating Christmas in the heart of Westminster comes with a variety of options at Church House. The Central London events venue can accommodate between 50 and 550 guests, depending on the style of party you choose. The largest event space the Assembly Hall provides a traditional setting with English oak panelling and a striking 30 foot glass domed ceiling. The space has 15 arched windows all of which can be blacked out and with the expertise of the in-house audio-visual team, the room can be transformed to create the atmosphere best suited to your Christmas party style. In the Assembly Hall we can accommodate up to 372 guests for a seated dinner dance and 550 standing, the space can also be used in conjunction with one of the other 19 venues at Church House, where you could hold a reception prior to having your dinner and dance party in the Assembly Hall. The Bishop Partridge Hall is always a popular option if you have a slightly smaller group for a Christmas party as it can accommodate 90 seated and 150 reception style, or as a drinks reception space in conjunction with the Assembly Hall. This space again offers a traditional setting with stucco ceiling, traditional oak panelling and a stunning stone balcony offering views which overlook Westminster Abbey. The Hoare Memorial Hall on the first floor and the Robert Runcie Room on the second floor are two other spaces in the events venue that are chosen for Christmas parties. The Hoare Memorial Hall being on the first floor is often used similarly to Bishop Partridge Hall as either a smaller party venue holding 250 guests for dinner or for a drinks reception before guests use the Assembly Hall for their dinner dance. This room is steeped in history and can offer a traditional setting with oak panelling and art deco chandeliers. Whereas the Robert Runcie Room is more frequently used as a stand-alone space as it is on the ground floor with convenient access to the Great Smith Street entrance and provides a more modern setting for a Christmas party reception or dinner. The space holds 80 for a dinner and 120 for a reception. For Christmas parties Church House Westminster has designed a Christmas package from £110 per person exclusing VAT. The three course Christmas menu created by our in-house catering team offers a seasonal seated 3-course menu. We also offer a variety of menus for drinks receptions with a Christmas twist. In addition, we will gladly create a menu especially for your event incorporating all special dietary requirements. Some audio-visual items are included in the Christmas package, but again for anything bespoke the audio-visual team will be able to help transform any of our 19 spaces to suit your preferred Christmas party style. 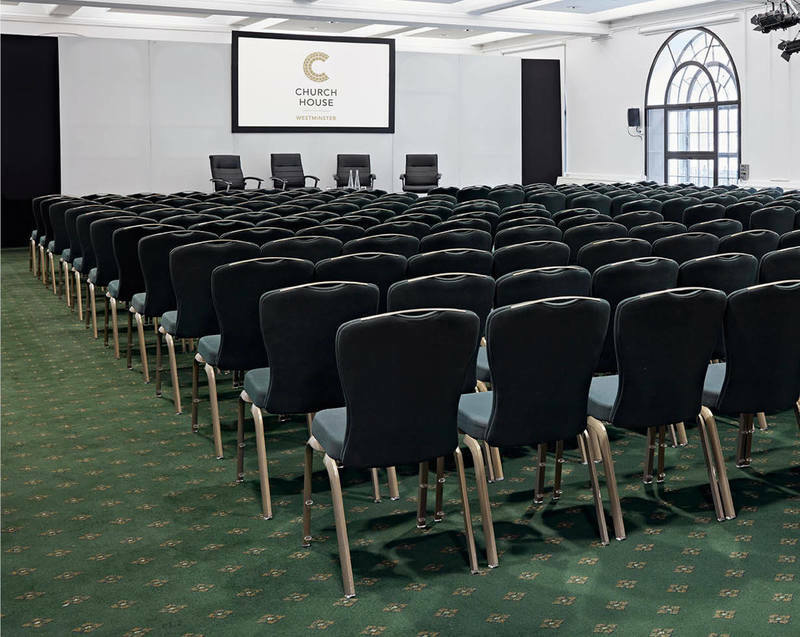 Church House Conference Centre in Central London has nineteen rooms in total and the ones not mentioned can also be used for Christmas lunches and reception parties. Please see the rooms page for options. For all Christmas party venue enquiries please contact us using the contact form or on 020 7390 1590.